Standard operating procedures are a systematic way of making sure that biopreservation processes, tasks, protocols, and operations are correctly and consistently performed. They are the basic documents of biorepository quality management systems and are used in quality assurance, control, and improvement. 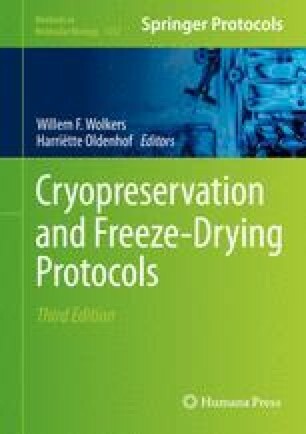 Methodologies for constructing workflows and writing standard operating procedures and work instructions are described using a plant cryopreservation protocol as an example. This chapter is pertinent to other biopreservation sectors because how methods are written, interpreted, and implemented can affect the quality of storage outcomes. The authors gratefully acknowledge Dr Jason Johnston and the helpful advice and guidance of colleagues at the Integrated Biobank of Luxembourg. Risk and quality management information is provided for general use; readers have the ultimate responsibility to ensure quality and safety issues are addressed according to institutional obligations. Mention of trade names or commercial products is for the sole purpose of providing scientific information and does not imply any recommendation or endorsement by the authors.